Balancing around power can be a brutal problem. There is a great video by Extra Credits where they talk about power curves in card games. Watch it now (it’s the video at the top) before reading the rest of this post (it’s well worth your time). I want to continue to the discussion and turn the slant towards a single player RPG experience and how power creep is the driver, and killer, of fun. Kind of like time, power creep will eventually kill you. For games with a finite end, this power creep issue is hard, but it makes the issue contained to a known “space” and design becomes a little easier. But when there is no end and you want there to be a forever power curve like I’ve been designing in Grrbls, then this power creep issue is not just an elephant in the room, its a blood thirsty wolverine. The core goal behind Grrbls was a loot driven RPG. The main focus has been, and will always be, about finding epic-meaningful-diverse-interesting-exciting loot…forever. That forever part has proven to be a nasty thing…but I’ll circle back to this point in a moment. 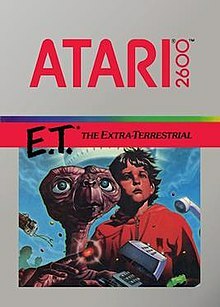 Since I was 3 years old, I’ve been gaming, and full disclosure I played a lot of E.T. for the Atari and I don’t recall hating the way it’s hated now (this is not a defense of the game though!). What does E.T. have to do with this post? Nothing, but here’s a picture anyway. One thing that has never changed from when I was 3 to now (30 years later), and that is I love the feeling of getting more powerful in a game. I like finding new gear (even if it just makes my stats better). I really enjoy that feeling. Leveling up also achieves this feeling too. I still don’t know exactly why, but I can definitively say getting more powerful in a game has always been one of my drivers in playing an RPG. For me, stat maxing is more important than any other aspect of the game (especially story). And I would always feel a twinge of sadness when I hit max level. I love to 100% a game, and I’ve done it many times (for example in FFX I got everything, even the reward for jumping a lightning bolt 200 times in a row, and in FF4 I got the Adamant Mail by farming for the super rare drop that took me almost 40 hours of playing the same battle to get). 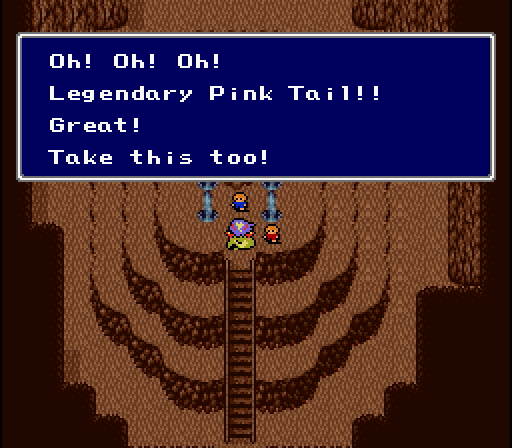 I got this in FF4 and it was so worth the 40 hours it took! The disappointment I felt with games when I maxed my power was that there was not a whole lot to do with these godly items and stats. I loved the journey to get to the top, but I was disappointed with the view. Sure there was usually 1 or 2 super hard bosses, but that was it. With Grrbls I wanted the journey and the view at the “end” to be amazing. But as this post mentions at the start, managing power curves can be a brutal problem because the thing that gives the player that “new item high” is also the thing that makes difficulty a joke and ruins fun. If you’ve ever played a game with God mode on, I’m sure it’s fun for a few minutes but then it becomes stale fast because there is no challenge. It’s the same with these power curves, you can maintain some fun for a bit at the top of that power curve, but the game will quickly become boring if there’s not a sufficient challenge. The brutal problem about power curves is not that it throws off balance, it’s that it will ultimately kill fun (at least if you use the balance logic most games use). It’s almost like a game has a certain “fun bank account”. And every time you get a better item or level up, you withdraw some cash. Once you get to the end of the game, and found the best items, you’ve withdrawn all the money. It’s great a ride, you feel great with the cash, but once you’ve taken it out that’s it. The game is over and so is the fun. There are no more bosses to beat, you are the best — and hence you have little reason to keep playing. I really really really want Grrbls to be a game you play for the rest of your life, periodically going back to it when you want a good solid loot rush. I’m not kidding when I say one of the first goals I had for this game was that if players spent less than 1000 hours in it, I would be disappointed. I expect, at a minimum for my target audience, that 1000 hours is the “least” you can expect from Grrbls. I hit a lot of dead ends and had a lot of bad prototypes by trying to design this infinite-looter and power curves were a big reason for it. A lot of my prototypes seemed like they’d work but once I built them and played them, I found out within minutes how boring they were. Most of the time the issue was momentum and how hard it was to maintain. But after years and years of trying, rewriting, redesigning, and never losing sight of my goal of an infinite-looter, I’ve hit upon a set of game systems that I think finally create the game I was aiming for. There is no “end game” with Grrbls. There is always a next level. And there is always better loot. I was able to achieve this by having 2 things at play. The first is that stats will always get better — but there are penalties as you move to higher levels. But you can offset those penalties by finding loot that is more powerful. The other is the emergent battle system. There will be a near infinite way you can build characters (which can have up to 4 classes per character, and with 3 characters in a party you can come up with some real interesting combos) and there will be battle modifiers that make things more or less viable for your current party depending on the circumstances. With Grrbls the battlefield is always evolving with different modifiers and there is always different loot you want to hunt for. Plus there’s always a boss around the corner waiting for you to figure out and pummel. In an era where there are hundreds of games released a day, it would be naive to think my game is any more special than those. But I can tell you I’ve been working on this game for almost 8 years now (but the first 3 were in such a different direction you could say I’ve only been “officially” working on Grrbls for 5 years). In these 8 years, I’ve held true to my vision and as the game has become playable, I truly feel there is absolutely nothing like this. I cannot wait to put this game in your hands.